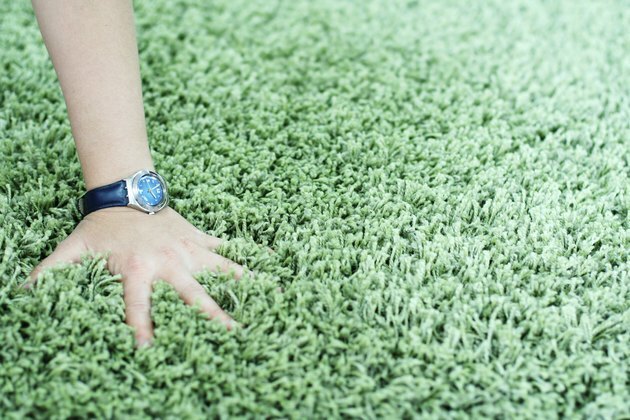 Even if the carpet in your rental home looks like it has had more birthdays than you, your rental agreement may not allow you to rip it out and replace it. Instead of living with that hideous floor covering, cover it up using your own homemade floor cloth or area rugs that suit your decorative style. Cover ugly carpeting with area rugs or a homemade rug. Cover all -- or at least most -- of that ugly carpet using an area rug. One large area rug per room can cover a majority of the carpeting beneath it. If the original carpeting still shows around the perimeter of the room, select rugs that contain neutrals or colors that coordinate with the original floor covering. For instance, if the carpeting is dark green, a beige area rug with a thin green line or vine pattern makes the carpet look a little less hideous. You can also make your own area rug large enough to fit the room by purchasing a carpet remnant, binding the edges with carpet binding and seam tape. Create your own custom floor covering from precut carpet samples, area rugs and carpet remnants of similar thickness by fusing all the pieces together with carpet seam tape. 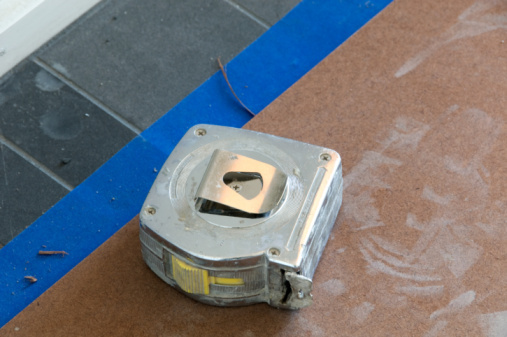 Plot your layout in one area at a time, and then slide a piece of the seam tape sticky-side up along the edge of one carpet piece, pressing the edge of the next piece onto it. Duct tape beneath the carpet remnants also works in a pinch. With different samples or remnants, you can make designs such as ombre patterns or concentric squares, or go bohemian with an assortment of patterns and colors for an eclectic look. Charity salvage shops and carpet outlets are two places to find flooring materials on the cheap. Create your own floor cloth from a roll of canvas or sailcloth to cover even the most appalling carpet. When you move, take the floor cloth with you. Use preshrunk canvas, or shrink it yourself by wetting one side, then the other, atop a plastic tarp. It may lose as much as six inches in all directions after it dries out. Iron a hem around the perimeter, and then use hem tape to make the hem permanent. Paint a design of your choice on the dry canvas using latex or acrylic paint after applying chalk to plot out your patterns beforehand. Paint the entire cloth a solid color if you wish to have a non-white background color before adding designs. You can also use stencils and stamps to create detailed designs. Add stripes and chevrons with strips of painter's tape, painting a fresh color between the tape strips before peeling it away. Hide whatever carpet is left showing in the corners and edges of the room by creative placement of furniture and plants. Units such as bookcases fit snugly against the wall while hiding exposed carpet. Arrange a series of plants along the perimeter of the room to hide the remaining carpet. Use a waterproof carpet runner or series of plant trays beneath the plants to help protect the floor.